An old postcard shared on the Twitter account "Postcard from the Past" (@PastPostcard) by Londoner Tom Jackson relays the following, "We are enjoying our holiday in Redditch," with another tweet saying, "Having a nice time but the weather is not so good; also I have not been so well." Similar words now accompany the photos we share on social media allowing others to have a digital postcard experience unlike the traditional experience offered by traveling friends or family members. İpek Özbay (L) and Zeynep Özbay (R). In the age of ubiquitous connectivity, there is a decreasing need for post offices from which to send postcards via "snail mail," replaced instead by Snapchat and Instagram where we can share travel moments anytime, anywhere. On the other hand, postcards have a nostalgic appeal, delighting us as a private channel between the sender and the recipient, be it an older relative or your grandmother, serving as a visual reminder of the past that usually ends up stored in an old box in the attic as a historic, pictorial reminder of the physical fabric of our lives over the years. But how can we possibly save these from falling into oblivion or remaining as merely a memoir? Two Turkish sisters - İpek Özbay and Zeynep Ayşe Özbay - recall their own striking memories from childhood: postcards. The Özbay sisters are both postcard designers and run Paper Street Co., an Istanbul-based initiative where this nostalgic tradition utilizes modern touches. "When we were small, we used to receive New Year postcards from our family members. I used to exchange postcards with my sister Zeynep when she was abroad and collected a bundle of postcards throughout her stay. Our living room is literally covered with postcards," İpek told Daily Sabah. In the following years, the sisters' postcard fervor evolved into a platform where one would send postcards to the other. Although they come from different backgrounds, their biggest dream has come true. After living in Montreal for three years, Zeynep studied film and digital media at the American University of Rome while İpek studied business at Koç University and worked in marketing communication before she set up Paper Street Co. with her sister. To design a postcard, they can be inspired from anything - it can be popular culture, music, a book or daily thing. "I create postcards mostly on graphic fonts," Zeynep said, adding, "It can take as short as 20 minutes to design it but sometimes I spend two or three days." Paper Street Co. has twelve designers, three of whom are in the main team. Some designers work on digital illustrations, while others scan their hand-written designs. From abstract depictions to a family union scene celebrating bayram or a "Miss You" themed postcard to another featuring a scene from renowned the movie "Selvi Boylum Al Yazmalım" (The Girl with the Red Scarf) featuring Turkish actors Kadir İnanır and Türkan Şoray, the postcards are always created with a unique touch. The team's best-selling postcards are generally those with funny messages. "Customers buy postcards that will make the sender smile or laugh," İpek continued. Aside from locals, the team also receives orders from the city's expats. "Since the very beginning, we have been aware that collecting or sending postcards seems niche. It is not realistic to think the platform will instantly boom. This is because our primary target audience included those who already have an interest in postcards," İpek continued. The world's first picture postcards date back to the late 1800s, appearing after a series of developments paved the way for a new postal age in those days. The 1893 Chicago World's Fair actually marks the beginning of the postcard age. The earliest postcards produced mostly in Europe featured images of royals, national flags and famous buildings. Through the representation of national and regional symbols, they established a link between regional identity and tourism. In the 19th century, Austro-Hungarian Max Fruchterman was the most prominent early publisher of Ottoman-era postcards. His postcard series offered portraits and insights into daily life, leaving aside the views of Ottoman territories. The Özbay sisters also questioned how people gave up sending postcards to each other over the years. İpek said, "We design postcards not as a means of communication, but a gesture; like sending flowers to your loved one. It is clear that people are lazy to go to the post office to send it and that is the starting point of Paper Street Co." Receiving postcards evokes nostalgia but the sisters add a digital dimension into it. "We don't think that the postcard tradition will just be lost in the dusty pages of history. Like us, there are people outside, keeping this practice alive. They either see it as memoir or even hang it on the wall," İpek said. The sisters note that the habit of sending postcards is not as strong as in some European countries, yet they are hopeful about the current atmosphere. "This tradition will continue as long as post offices exist. Communication is easy and intense today, enough that we can share anything we have on our minds. 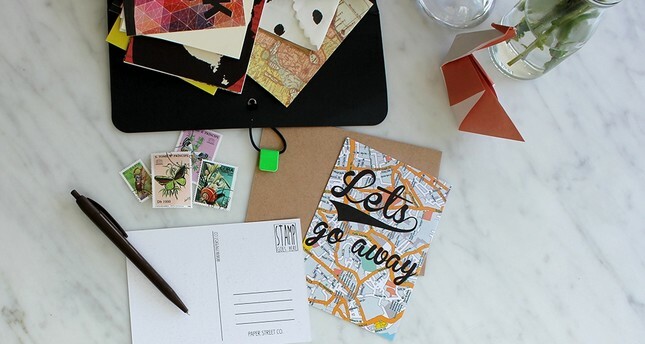 In contrast, you have a limited space in writing a postcard and it evokes a special feeling. This is why we think carefully and select each work while writing. It turns out to be a romantic practice."